These easy campfire recipes are guaranteed to amp up your next camping trip! Campfire recipes do not have to be limited to burgers and corn on the cob every night. Here are 21 of our favorite camping recipes, from easy camping meals to campfire skewer recipes and campfire desserts. Want some bacon and baked means? We’re in! This is one of those slow-cooker recipes where you simply add BBQ sauce and let it do its thing. A classic campfire dish that will surely be a crowd-pleaser. All you need is a tube of cinnamon rolls, a stick, and a campfire to enjoy this easy roasted cinnamon rolls recipe. It is great for breakfast, brunch, or dessert. Mix it up by using biscuits or rolls for a dinner side dish. Grab some potatoes, bacon, cheese, and onions, and soon, you will be salivating over this dish. Make sure to bring your cast iron dutch oven, too. 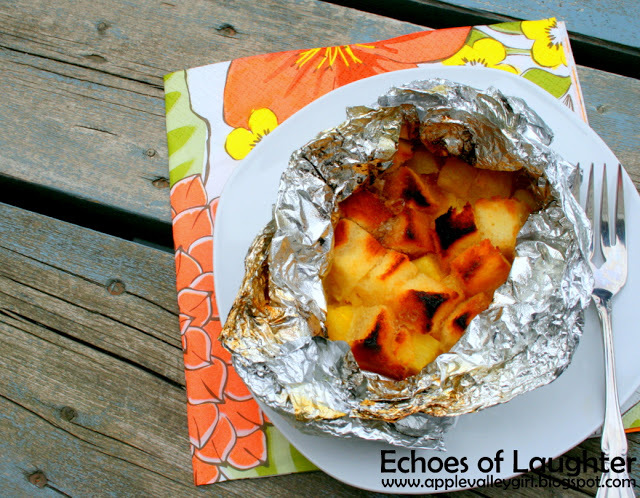 If that’s not convenient, you can also make these cheesy potatoes in tin foil over the campfire. Take the hassle out of campfire cooking with this easy breakfast dish. Bring together bread, eggs, bacon, and butter, and this breakfast bowl is complete. Get ready to transform an orange into a tasty treat that will surprise the whole family. 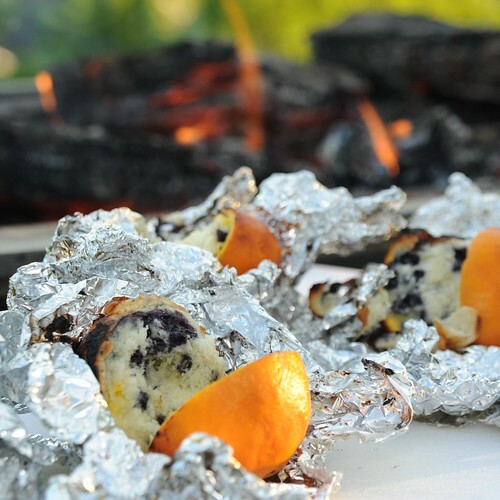 In this magic trick, you bake a blueberry orange muffin within an orange after it has spent time in tin foil over the fire. 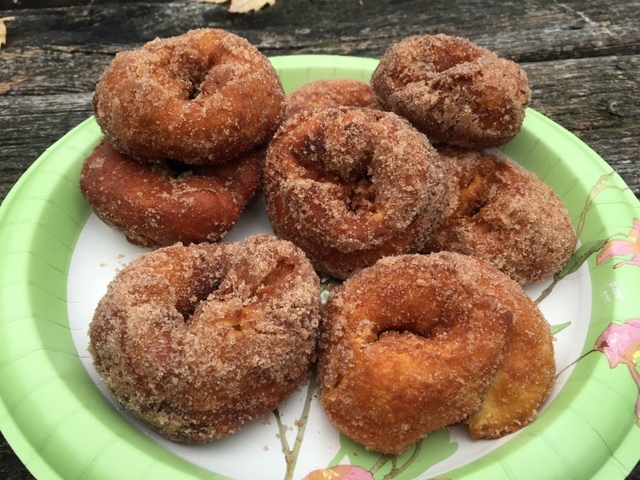 Turn your favorite biscuit dough into sweet and satisfying campfire donuts. In just a few simple steps, this dish can be your go-to breakfast on any camping trip. Prepare this meal before your camping trip, and throw it in a ziplock bag. When you’re ready to eat, just add water and boil. It’s a simple main dish recipe that tastes like a home-cooked meal. You can make this dish before you head out into the woods or prepare it once you have picked your camping spot. Either way, this campurritos recipe makes for a hearty dish that leaves everyone satisfied. 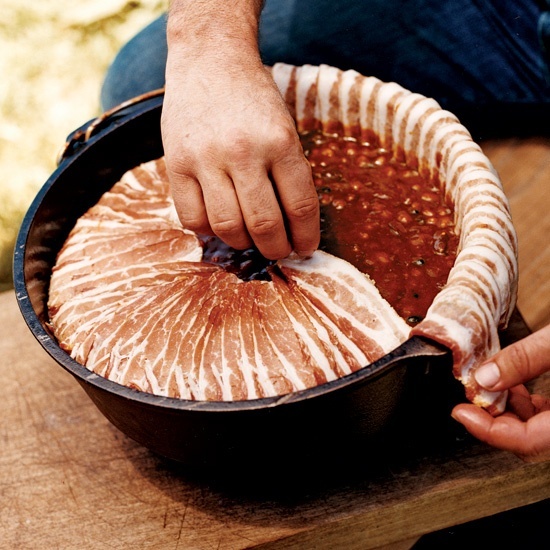 With one pan, you can create this flavorful dish while camping outdoors. 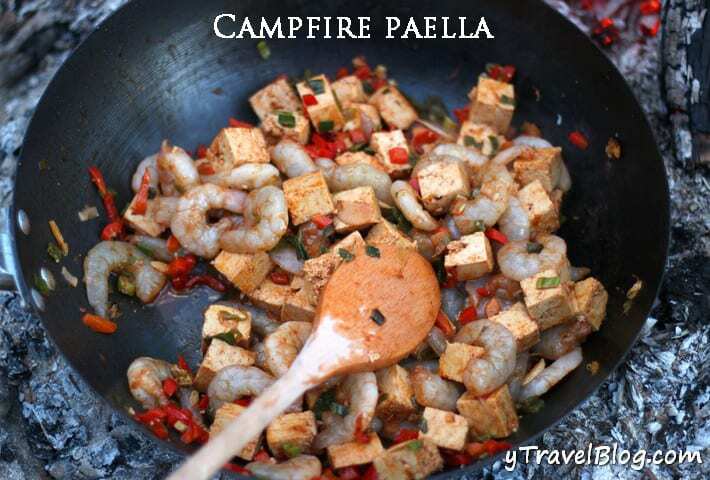 Use your favorite protein and spices for the best campfire paella dish. Quench your fired-up appetite outdoors with this one-dish meal for lunch or supper. For cold nights camping, we recommend a drink recipe that will warm your insides. This simple hot whiskey recipe from Jamie Oliver is simply perfect for cold nights outdoors. It requires whiskey, boiled water, lemon, and clover. Add honey if you want to add sweetness. 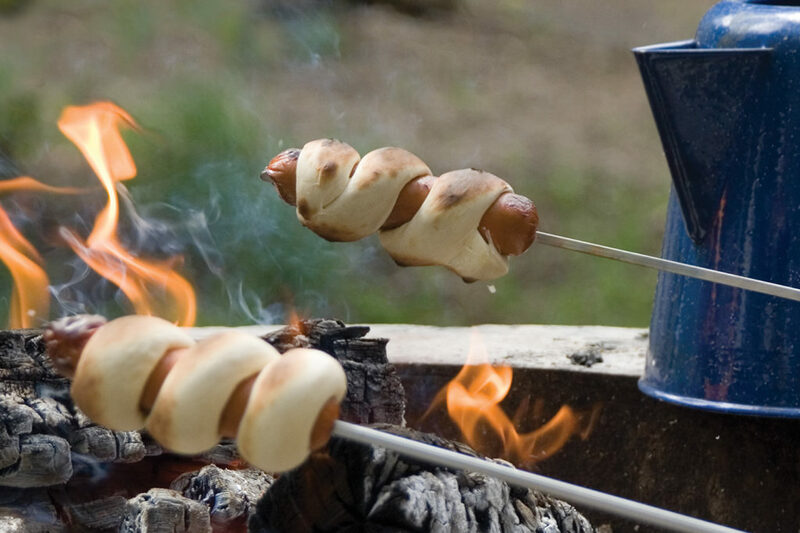 It is not a true camping trip without everyone’s favorite quick campfire recipes – hot dogs roasted over the fire. Mix it up a bit by wrapping your hot dogs in dinner rolls to create fire-roasted pigs on a blanket. Your little campers will be delighted with this tasty treat! Pizza may not be the most common camping food, but it can be done. You will need dough, sauce, cheese, and your favorite toppings. Cook a delicious pizza over the fire in a cast iron skillet and enjoy something better than delivery pizza. 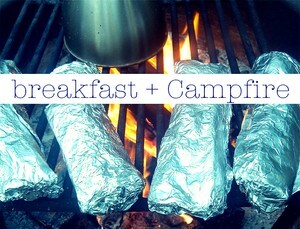 Foil campfire cooking recipes are great for outdoor trips. With parchment paper and foil, you can cook just about anything over a fire. This delicious mixed mushroom recipe will complement any night in the great outdoors. If you want to go all out, give this caramel apple pie a try. It’ll be a tasty treat the whole family enjoys around the campfire. Use tin foil to make this pineapple upside down cake after dinner. This recipe requires just a few ingredients and bakes quickly right in a tin foil packet! You can also add a dollop of whipped cream or a scoop of vanilla ice cream. It’s not a camping experience without campfire s’mores. Mix it up with this poundcake s’mores recipe. This will definitely put your campers at ease after a long hike! You don’t have to leave all the comforts of home behind when you go camping. With this chicken recipe, you can have a bowl of warm chicken stew heated over the fire. It will turn into a crowd favorite for supper on your camping trips. Looking for a unique recipe to make on your next trek into the woods? 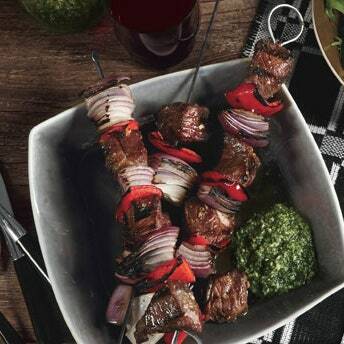 Give this lamb kebabs recipe a try. It is a camping skewer recipe you can’t skip. With this apple pie on a stick, you can leave the fork and knife behind for an easy campfire dessert or snack. 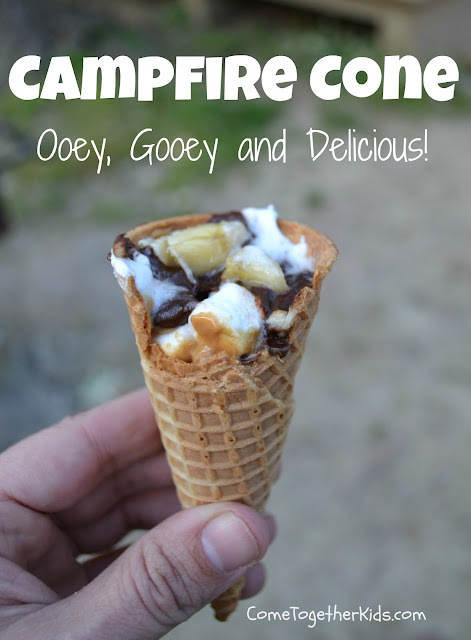 Add a little marshmallow, chocolate, and even peanut butter to create this tasty campfire cone treat, a fun take on the classic s’more. No camper can turn away this fancy outdoor snack. 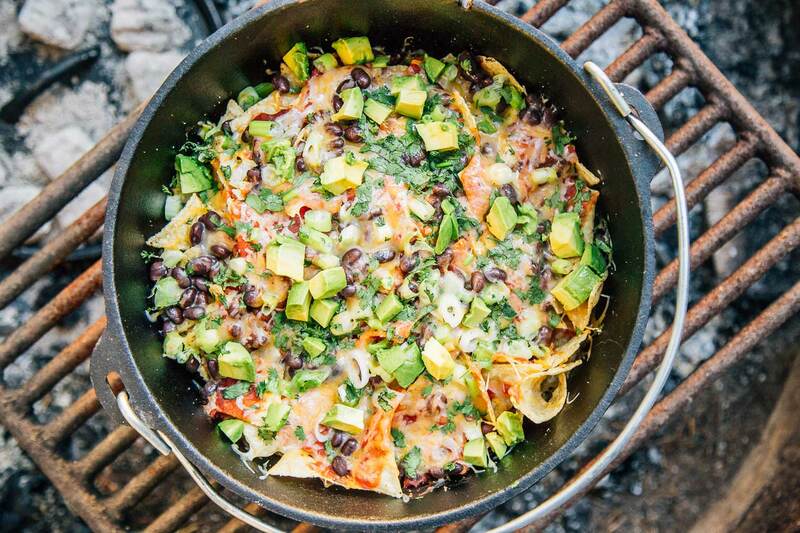 Nachos are the ultimate camping comfort food. It is quick and easy to prepare and can be served any time of the day. If you have a hankering for some good ole Tex-Mex food, follow this campfire nachos recipe! We clearly like to mix things up and try out exciting campfire recipes. These are easy campfire meals sure to please on your next camping trip. Plus, if you can master cooking while camping, you will have an invaluable skill when the SHTF. Master these quick and easy campfire recipes, and you will certainly become the designated campsite chef. Do you have other campfire recipes for occasions like St. Patrick’s Day or Valentine’s Day? Let us know in the comments section below! If you’re looking for useful survival gear that you can’t make at home, check out the Survival Life Store. Editor’s Note: This post was originally published on January 27, 2017, and has been updated for quality and relevancy. I would like to know more about number 5. Sunrise Breakfast Bowl, and number 13. Curly dogs Please. This is a weird mix of things that could be campfire cooked, and things that clearly you need an oven for. sort them better or title them better. Looks like only #5 would require an oven; everything else would be doable with a campfire or grill. In fact, you could make #5 with a solar oven or a campfire oven [http://www.trails.com/how_32543_camp-oven.html]. Personally, I can’t wait to try the potato boat. They all can be done on a campfire. Try it before you hack it! these sound really awesome and I can’t wait to try these recipes out. I was trying to say that the 25 campsite recipes sound great and can’t wait to try them sometime. I like recipe for 6,14.19 please! Bookmarked this page. Those re some delicious looking recipes. I’m surprised you didn’t include the Boy Scout dinner, aka tinfoil dinner. Use a half pound of ground chuck for each camper and one baking potato. Lay out tinfoil and place the flattened hamburger in the middle and split the bite-sized cut up potato on either side. Add margarine or butter on top of the potato bites and salt and pepper to taste. Fold the foil from all corners to the center making sure the package is completely sealed. I use two pieces of foil to be sure no air can escape. Cook over campfire 30 to 40 minutes. To check done-ness, open foil pack and taste a bite of potato. If its cooked enough to eat, your meal is ready. If you’ve never eaten one of these before you’ll be pleasantly surprised to find the hamburger no longer tastes like a hamburger. It tastes more like steak. Simple to make and delicious ! Hey Michael…. I remember that meal from my days as a boy scout, we called it Pocket Stew. We also added onions, carrots, and green peppers to the mix. Add what you like to the mix you can never go wrong. Damn I am getting hungry now……. Where do I even FIND tinfoil? Only thing available near here is aluminum foil. Is there a cookbook with the recipes in it available? Wow, those bacon beans look amazing. Lots of delicious looking dishes on this list. Will be bookmarking this for later.